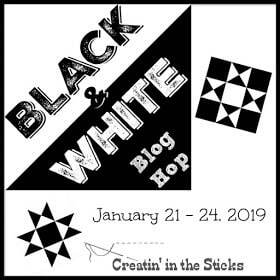 I am so pleased to be a part of the Black and White Blog Hop, sponsored by Carla Henton at Creatin’ in the Sticks. Carla always puts a great group of quilters together and I have loved what I have seen the past few days! 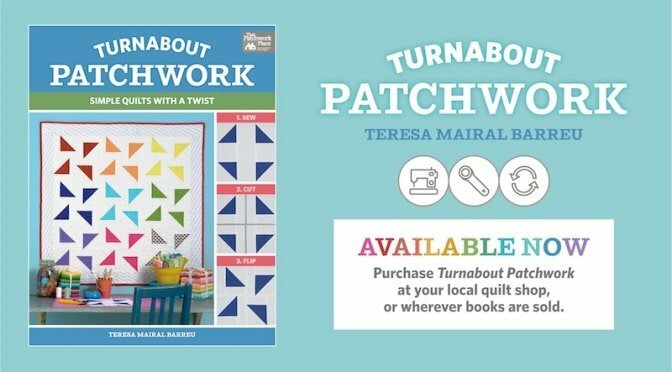 I have been waiting for this book, Turnabout Patchwork*, to come out. I have been watching the author’s videos, Therese Mairal Barreu for well over a year and am always fascinated with what she does. A few weeks ago I bought the book and the project was born. To get more information on the book, please click here, and sign up to get her videos – you will enjoy them. I believe she has a blog hop next week, so keep an eye for more eye candy! I decided to use Island Batiks (fabric given to me by Island Batik) and a quilt was born. We could also use a touch of color and this Living Coral spoke to me – it is the Pantone color of the year. This batik may be a touch brighter, but I love it so I went with it. It is “tangy” from the foundations line from Island Batik. The solid black and white are also Island Batik and boy are they delightful to work with – the tight weave but lightness of the batik fabric – I love it. The black & white batik print was stash – a tiny piece – I have no idea where it came from and that was all I had! Here’s a picture of the quilt, ready to be quilted. I used the wonderful Hobbs Thermore batting* (again a part of the great bounty supplied by this sponsor of the Island Batik Ambassador program). It is so nice and thin and easy to work with for this wall hanging. Now, I have a couple of little things that I did that I’d like to share with you. I am loving Electric Quilt 8*. Earlier in the process I auditioned different ways to layout the quilt. I tried scattering the coral fabric but didn’t like that. I rather liked creating two other pinwheels, made of parts of the other pinwheel blocks. Then, I was onto figuring out some choices in quilting motifs. Here are a couple I like. I choose to use a Mettler 5o wt. #0822. It was a little darker than the fabric, but not too bad. Once I selected this stencil the dilemma was how the heck was I going to get it on the quilt?? I can’t just freehand this design. I doubted I could draw it. SO….I went back to my tool box from a long time ago. I could make a stencil but I didn’t want to. 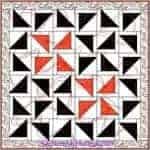 I could print it and transfer to Golden Threads Quilting Paper for quilting and make 4 copies and pin those to the quilt and machine quilt through them. That sounded tedious. I just went for it – printed it on thin paper, taped it together and quilted one section. WELL, it was okay but a little difficult. I then thought I could print on paper and cut it out and trace around it with a Silver Clover Chaco Liner*. BINGO! 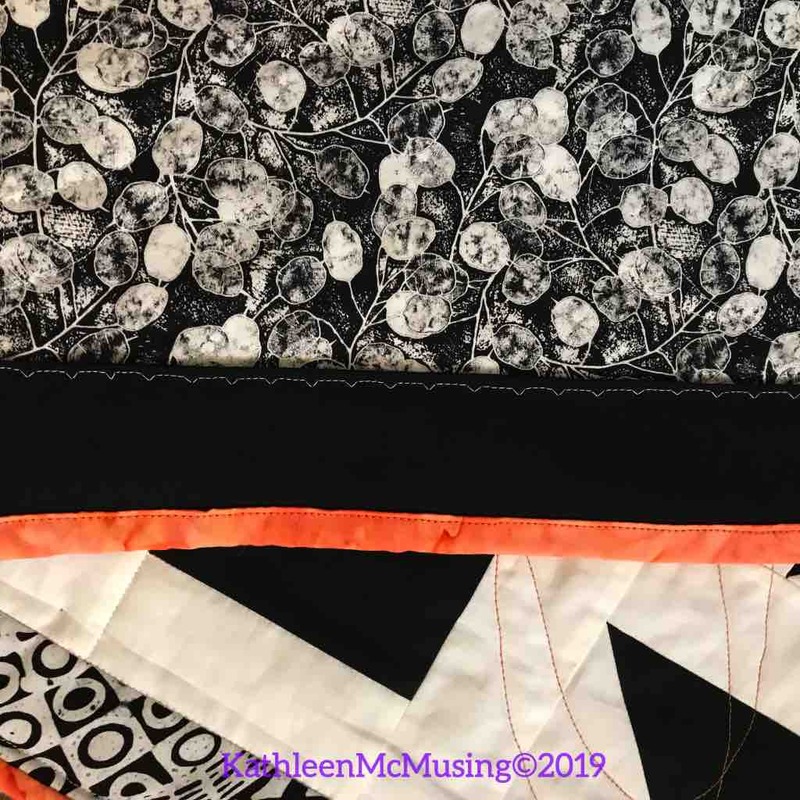 Fast and efficient – pinned this ribbon down, traced and then quilted. Repeat. AWESOME! I always lay my binding strips this way to sew them. The bottom strip is facing left with its printed side side facing me. The next strip is printed side down and the strip is vertical, going towards me. Why is this important? It means I always know how to do it and make that nice little angled line that takes your eye away from the sharpness of a horizontal line. I also use this same technique when joining the binding. It creates a clean finish – almost impossible to know where I started and ended! When I attach my binding I leave 5″ unsewn at the beginning. When I get to the leave about 10-12 inches between the beginning and the end of the binding. I cut the lower edge (closest to me) about halfway between the two and mark with a line. I set up the pieces exactly the same way as I pieced the binding. I then pin it to double check that it fits. Here I have pulled it to test it fits before sewing. 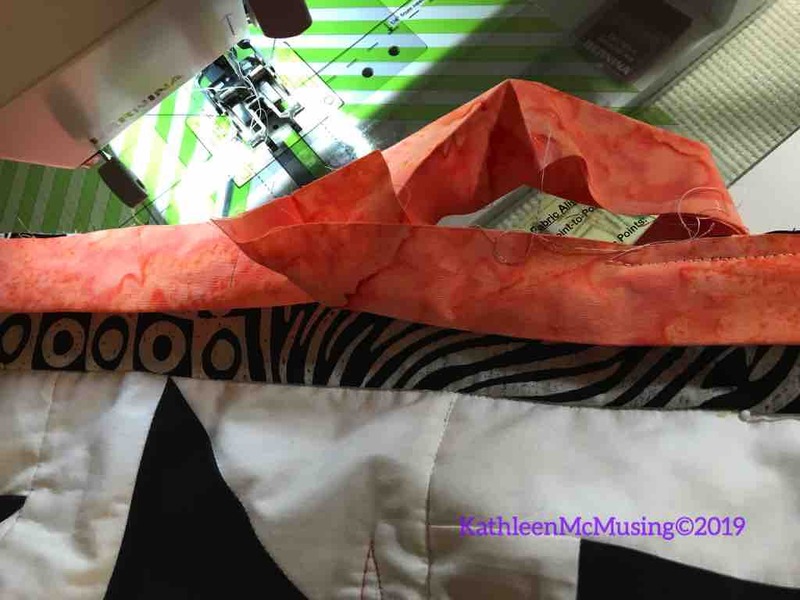 It does – so I sew the diagonal seam. Trim. Finger press open and then finish sewing the binding to the quilt. Now for another exciting discovery!!!! I used a blind hem to attach the bottom part of the hanging sleeve. WHAAAT??? Yup, if you are careful no stitches come through the front. 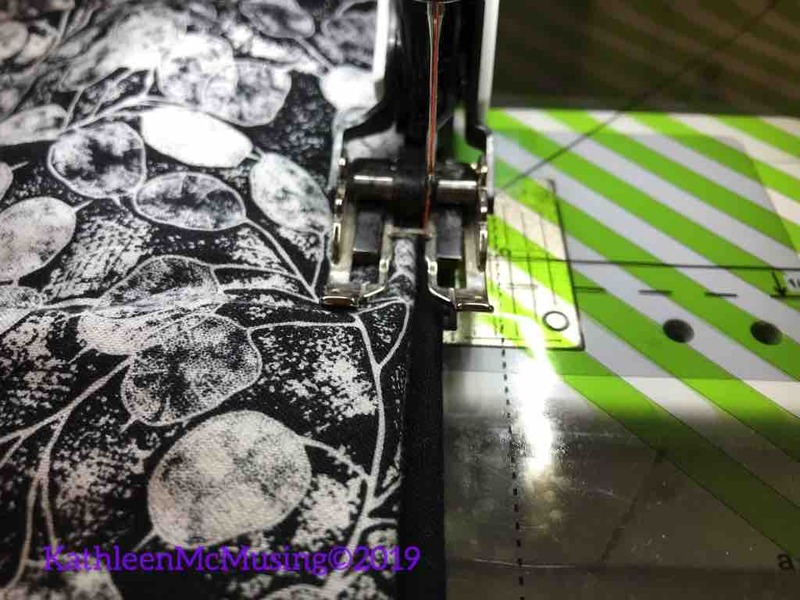 Almost all machines have this stich……. ^___^___^___ Is the way it looks on your machine. Now I probably wouldn’t use a white bobbin thread, but you can see how it looks on the bottom – good enough to hang against the wall. And, if I was being crazy about it, I would use my sharpie to hide the threads. Yup, its been done many a time! 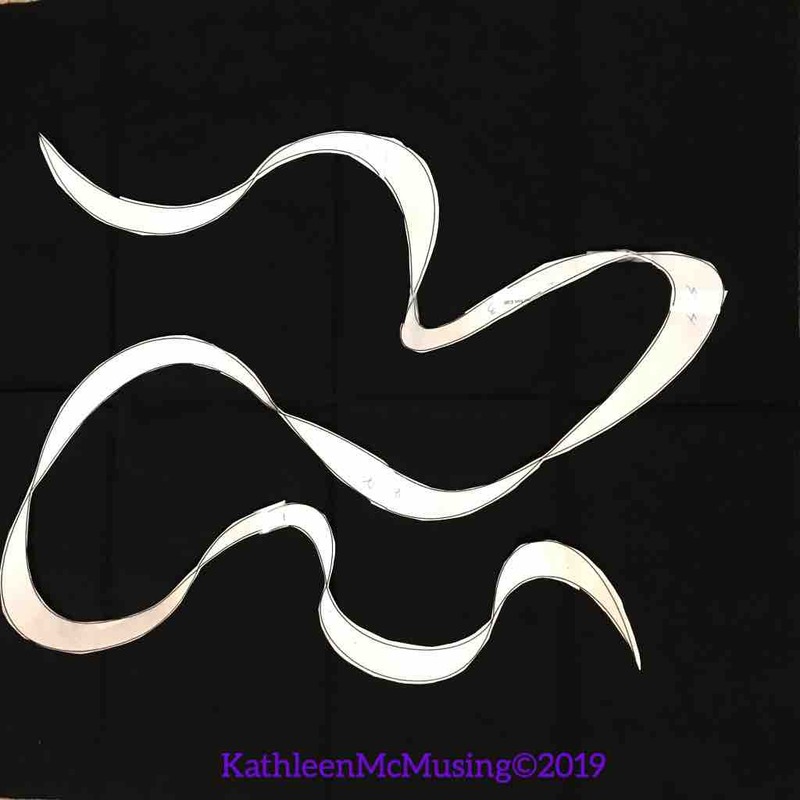 https://www.kathleenmcmusing.com/giveaway/black-white-giveaway-2So, that is my story and I am sticking with it! 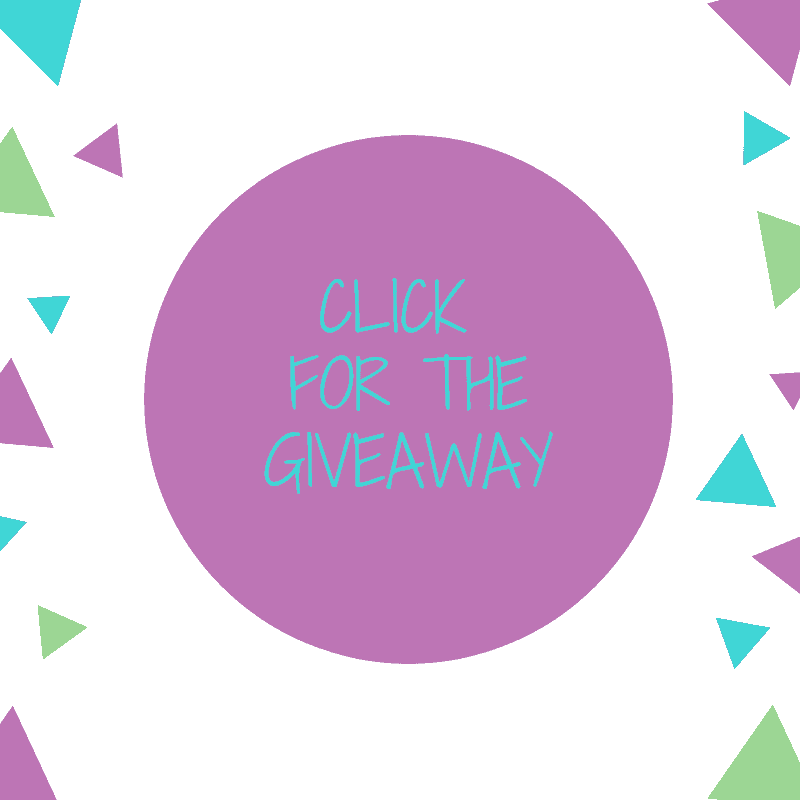 The giveaway is at the bottom of this entry, please join in. Its a new one for me, so let me know if you are having trouble with it. It should be straightforward! Please remember to Visit the other bloggers and comment on their terrific work both today and tomorrow! Previous Post Blog Hops, 2 blocks and a tease…. Next Post Getaway to Dragonfly Island! You are more than welcome! It does look very modern and the coral makes me happy (must be the grey winter). Stunning quilt! The Living Coral plays so well with the black and white. The living coral is growing on me more and more as a color. Now, if I could just be in Bermuda with living coral…winter bores me in New England. Thanks. When I tested. Of course it worked. Argh. Thank you very much for sharing your beautiful black and white project with us, Kathleen. The coral with it is stunning. Beautiful quilt! I think the addition of the coral was a great idea. I love the coral. It is funny as I am not usually a coral girl. Gorgeous quilt! The pops of coral makes it look very modern. Thanks, Anita! It was a fun one to make. Really pretty. Very clean lines and modern look. Thanks, Gin. I am so pleased with the way it turned out. What a wonderful quilt Kathleen! Wholeheartedly agree on the Island Batik batiks. I do my binding the same way but learned a trick: at the end, whatever width your binding is overlap the two ends by that much. So 2.25” wide binding, cut the first end where you want the join, overlap it with the second end by 2.25, cut straight. Lay them as you show perpendicular and mitre as you did. Thanks for walking us through the quilt motif process too. So much brain work involved in quilting right?! Which is good. Sandra, it was a really fun one to do! 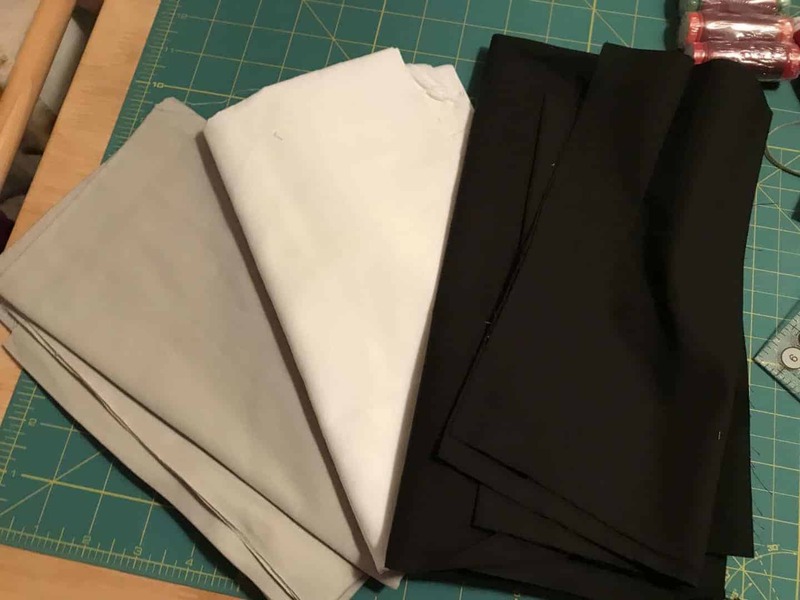 Even though I know that works, I hate cutting and finding it is wrong, or my hands didn’t do what my brain thought, so I always check, sew, trim….it works every time! That touch of color totally makes this quilt a winner…love it! I enjoyed reading your process for quilting. My FMQ is iffy at this stage, so using your method sounds great. Thanks for all the tips! It is a great way to freemotion. I find domestic machines are so much harder than a longarm for trying to get “big” repeats. It works and I was pleased with it. Your quilt is amazing and the details you have explained – love. I must try a blind hem stitch, I have on clothes, but never thought of it with quilting. THank you! Thank you, also, for joining the B&W blog hop. Love your post! Isn’t the blind hem thing wacky? I never thought about it before but it does work and is fast!!! That turned out so well. I love the pop of coral in there. 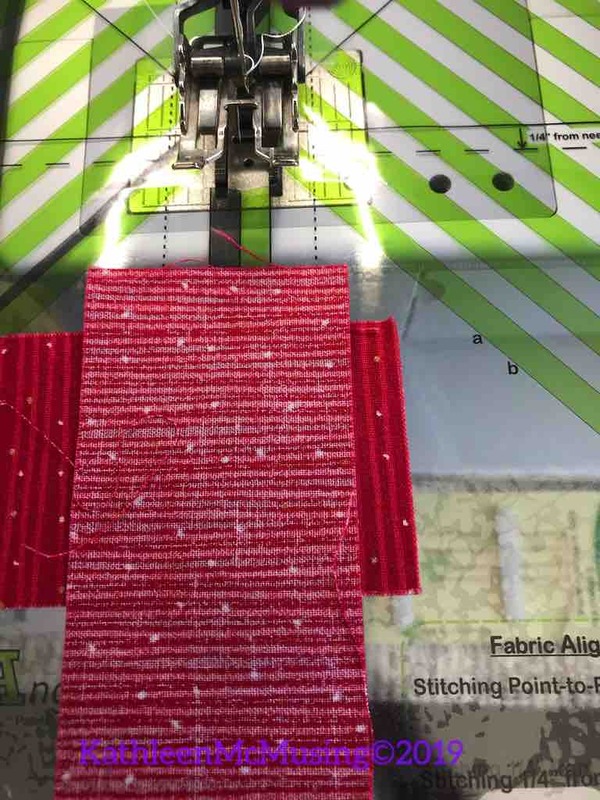 The idea of a blind stitch sounds amazing. I will have to give it a try. It could life changing on the night before a quilt show drop off! There are so many great stitches on the machine that I never learned – blind stitch being one of them. But it would be so useful!! Hard to find the time for work on all that I want to – common complaint among all of us, right? The coral is gorgeous with this black and white. Perfect addition. Thanks, Bernie. I love trying new things for old ways of doing things, especially for those of us that started out quite some time ago. I never would have thought of that, but viola it is perfect! 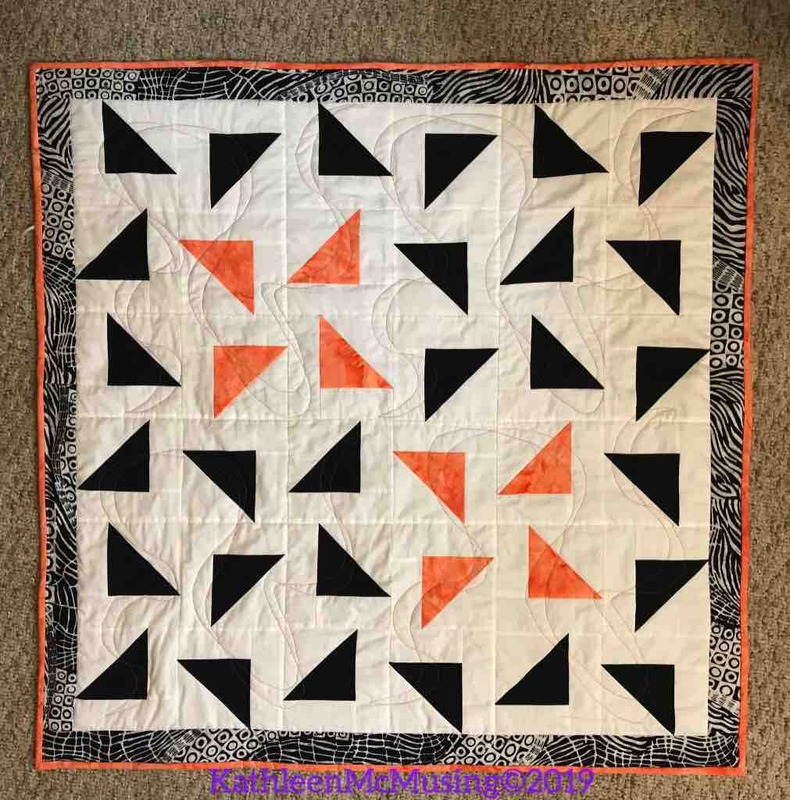 What a fun pop of color to add and the quilting motif is really fun! I felt like that qulting motif was a find; maybe next time I’ll free motion quilt it. Thanks, Lori. It was really fun to make. You have made a beautiful quilt. The coral looks great against the black and white. Thank you for sharing your binding tips and for offering the giveaway. Oh…what a fun fabric color to play with the b/w. 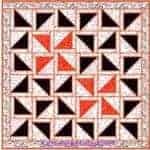 Makes for a very striking quilt! I think I could get into living coral as a theme this year. Beautiful quilt. Thanks for the binding photo-tutorial. It took me a long time (and several quilts) to get that part right. I taught for a long time, and never teach it to newbies. I think you have to have the binding join down to get it. Even then, it took a while for me to get a system that I can do everytime. 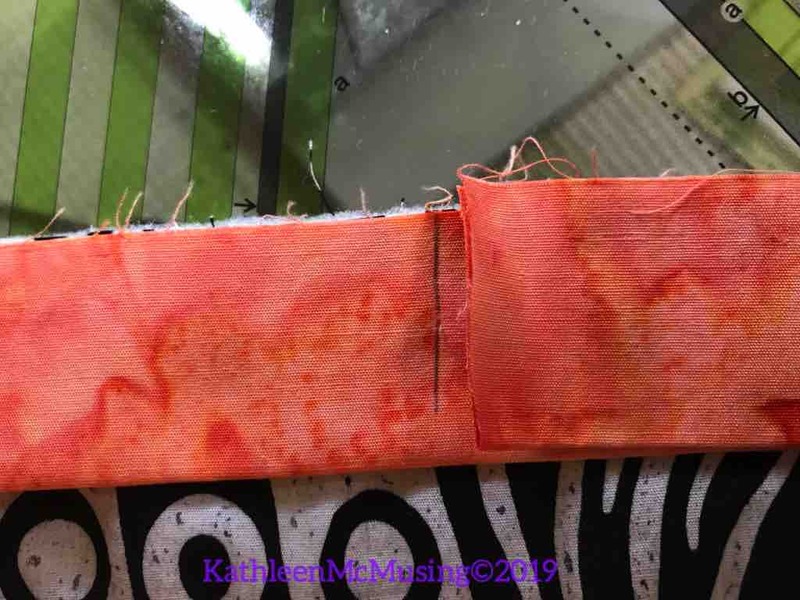 Ok Kathleen, let’s see a tutorial on the blind hem stitch for the hanging sleeve. I think I can visualize it, but just seeing a photo of how you arrange the quilt on the machine would help a lot. And hurry — I must attach a sleeve to my Guild’s charity quilt for quilt con this weekend! I’ll try to get on it tomorrow! But, I am not the first, but I would like to do one. Thanks for the tips. I won the EQ8 software, and I’m just starting to figure out a few things. Your quilt is beautiful! 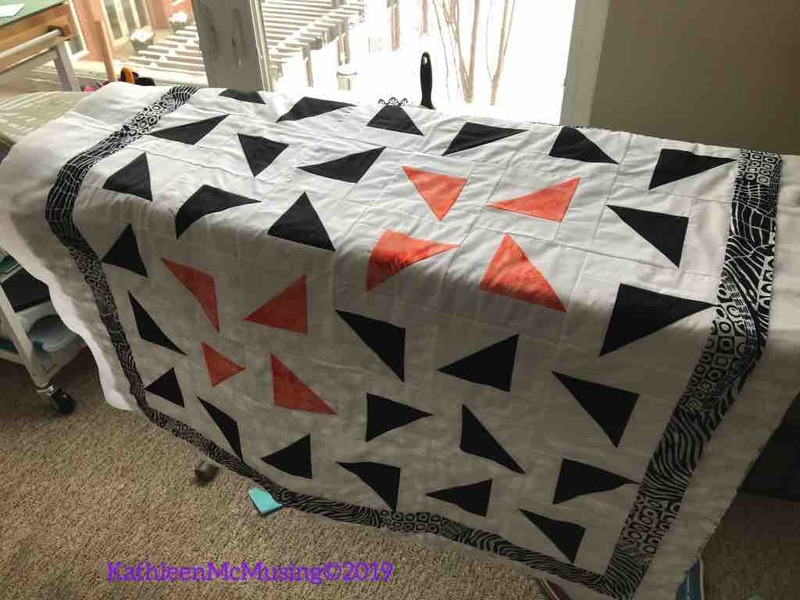 Nice little quilt – it’s amazing with HST’s can do! It’s a little deceptive, which I forgot to mention. It was making a block, then cutting it up and then reassembling a new block. That Coral really packs a punch!! Great idea for the Black and White Blog Hop. The quilt was more exciting with a pop of color! I thought it helped the spark keep going. I like how the binding matches the blocks inside the quilt. Kathleen I am loving this black and white with a splash of coral. The coral really gives it a bonus!.. Making the blocks was fun, but I forgot to tell that it was a make a block, cut it up and resew…totally fun! This is a great quilt, Kathleen! I am going to have to try your blind hem technique for attaching the bottom of the hanging sleeve! Thanks! Thank you! I am so happy with the technique – it is the second time I used it in a week. I love that little touch of colour in your black and white quilt. I’m not the first to think of it – and something reminded me of it. I had a quilt made last year for IB and I never attached it. I though lets go for it….BINGO! You will be so happy. And yes, I don’t trim until I sew – same reason. And, sharpies come in different colors….ha ha! I love the touch of red! It was a fun color to use. I tried purple and it wasn’t making me happy, but the coral did. Thanks, Barb. I enjoy doing it! Thank you! I rather love that quilting design too! I love the pops of coral and your wonderful descriptions. Thanks for taking the extra time to do the wonderful explanations. Often I am left scratching my head and not in this case. Thanks, thanks, thanks. You are welcome, Susan. I miss teaching and tend to do some in many of my entries. Thank you for the generous giveaway. Your modern quilt with the color of the year is stunning. Also, thanks for the tips so I don’t have to reinvent the wheel. Thank you, I am pleased with this fun little quilt. I love black and white fabrics and that little pop of color is wonderful! Great quilting design. Thanks for linking up to Wednesday Wait Loss. You are welcome and thanks for coming by! This is a fun design, and worth the wait! I love that Coral is the pantone color of the year. My daughter is thinking of naming her daughter Coral. 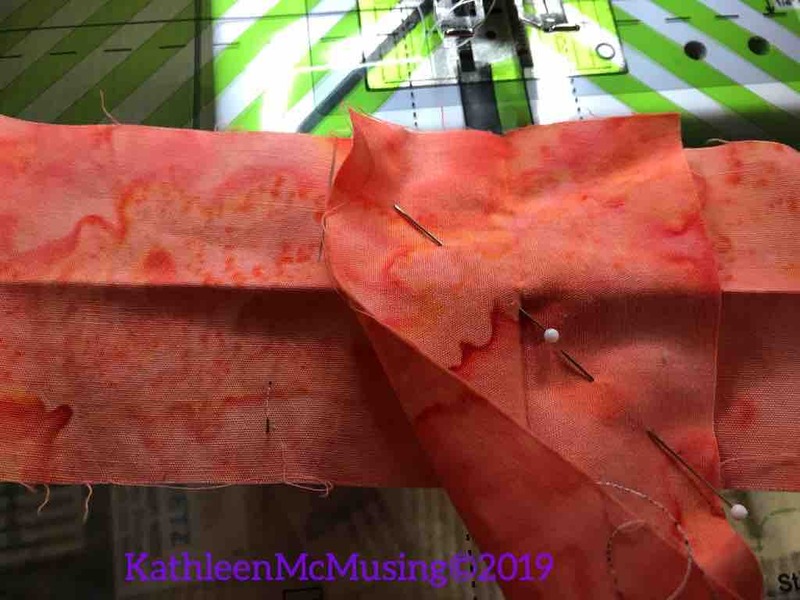 Great tip to hemstitch the hanging sleeve – that’s brilliant! And thanks for sharing your process of quilting. Looks really neat! Coral is a beautiful name. I think that will be a life changing thing that hemstitch! It is good to be reminded of other ways to do things, isn’t it. Lovely quilt, thank you for sharing it today. Very nice! And I will try your blind-hemmer tip for attaching the hanging sleeves, as that is a job that I don’t enjoy. Happy Quilting! It is a great technique – do try it. What a great quilt, Thanks so much for sharing! You are welcome. It was a really fun one to do! I love this little process, and the quilts are fun! I bought the kindle version, its working better for me these days not to have physical books! I have no idea how I missed this post! What a great quilt, from start to finish. I do my binding in a similar way, but not with a long strip at the end. I’ve never tried using my blind stitch on my machine, so I might need to play with that a bit. It happens – no offense taken. The blind stitch is really very good for this. I will do a tutorial this weekend – I hope. Time seems to slip away from me so we will see! Beautiful quilt, the coral just pops and is fantastic with the black and white. Just stopped by again and caught how you attach a hanging sleeve with a blind hem stitch. How clever and how did I never think of this? I am also borrowing your design idea for the black and white HSTs, with strips added to 2 sides. I am trying out invisible applique with mono filament clear thread, and that would be another way to ensure nothing shows through. I have been sewing for over 50 years but still discover stuff that isn’t new, but is new to me. Thanks for all of your helpful info. Actually the block is the one you see on the cover of the book – made with HST – a modifidied churn dash -then cut in half – then reassembled. Is it faster? Maybe. I did enjoy making them that way. Invisible thread is the perfect solution so it doesn’t show. I will do a tutorial but time seems to be going into some weird black hole!